Eaton’s range of 6kA high performance Miniature Circuit Breakers (MCBs) are manufactured to IEC/EN 60898, meeting the latest UK, European and International standards, with ratings from 2A to 63A as standard. Eaton’s MCBs are suitable for use on 230/240 V, AC systems and are calibrated for use at 40°C. 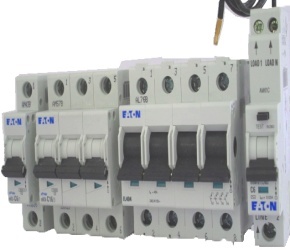 These devices suite with the other modular devices including RCBOs, RCCBs and Isolators, for use within Eaton’s consumer units and a wide range of other applications. The Eaton 6kA MCBs are fitted with box clamp terminals suitable for use with cables up to 25mm2. Available with both B and C characteristic curves as standard. Type B MCBs are most commonly used in domestic applications, however the use of type C devices may be desirable e.g. on lighting circuits where high switching surges are involved. Type D devices are not commonly used in other than industrial applications. Type C: Suitable for general use in commercial or industrial applications where the greater use of fluorescent lighting and small motors can produce switching surges, which may cause nuisance tripping of type B breakers. Type D: Suitable for General Industrial applications where there are a lot of high inrush switching surges associated with equipment such as transformers, large motors, welding and X ray equipment. The Eaton range of 6kA high performance Miniature Circuit Breakers (MCBs) has been designed to meet the latest UK, European and International standards, with ratings from 2A up to 63A as standard.